Many people think of homes or large buildings when it comes to demolition. Little do they know that demolition companies specialize in a lot more than just ripping down buildings. At Grand Rapids Demolition in Grand Rapids, Michigan, we do small jobs that you might not see from the outside. 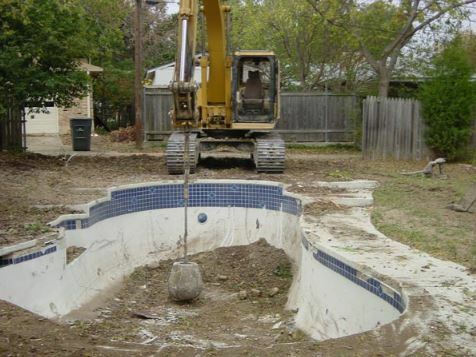 One of our specialties is pool demolition. We take care to help people remove unwanted pools that are in their backyards. One reason for people's desire for removal might be that the pool is just too expensive to maintain. If they never swim, they might find that it's simply a hassle to continue paying bills for the pool. Also, they might feel that local wildlife, like ducks, congregate in the pool too readily. The water might become a health hazard if it is not being maintained. Additionally, some people live in states, like California, where they are constant droughts. They might not feel that it is worth having a pool just sitting there in these conditions. They would rather have a garden or something that is a little more valuable to them. Pool Removal & Fill In? An in ground pool removal is an arduous task. It costs more to remove an in ground pool than it does to take away an above ground pool. An in ground pool might cost can vary in price. An above ground pool removal cost is more affordable. This might cost a couple of thousand dollars. The costs will vary depending on the size of the pool. A pool removal contractor will typically start by draining the pool. Then the engineer drills holes in the bottom. Finally, the pool removal contractor will demolish the top. Then, the pool will be filled with dirt and soil. This entire process typically takes from two days to a week. Swimming pool demolition is a costly endeavor. For this reason, the home owner should be sure that they want to get rid of it. A swimming pool removal service will take their time to do it right. However, once the process is completed, it can't be reversed. A DIY pool removal might not be possible. Experts do not recommend this. Also, if you do it improperly, you can create a dangerous scene. There is nothing worse than finding out later that you cannot expand your house or do anything with your land because you chose to fill the pool yourself. You might wonder how much it cost to fill in a pool with concrete. Well, this is part of the pool demolition cost. You cannot just drain the pool and fill it with dirt. You have to break down the concrete at the bottom of the pool. This will ensure that the soil passes inspection and that you don't have another pool forming from improperly broken down concrete. So the pool is not filled with concrete, but the concrete bottom barrier is broken apart and removed. The entire pool removal process might seem complicated, but at Grand Rapids Demolition, we take care of all the details to make your yard safe again.